A stolid biography by environmental historian Lear (Rachel Carson: Witness for Nature, 1997) that gets at the facts of Victorian Potter's life but does not bother addressing motivations and thwarted ambition. Born in 1866, Potter, a child of wealthy Unitarians in the calico manufacturing business, enjoyed a privileged upbringing between South Kensington, London, and the country homes of her grandparents in the Lake District and in Perthshire, Scotland. 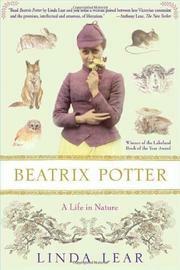 These locales stimulated her early interest in natural history, often a passion for the Victorians. Never sent to school as her younger brother was, but taught at home by tutors, Potter demonstrated an early talent for drawing, developed by copying animals and plants from nature, especially fungi and lichen viewed through a microscope. She eventually developed some theories about fungi reproduction, but they were dismissed as amateurish. (Lear argues that she could have become an expert in any number of fields, such as botany, archaeology, geology and mycology.) Approaching spinsterhood, and seething against a domineering mother, she first published some of her animal designs in holiday cards, then grew determined to become financially independent. Her first Peter Rabbit work had been fashioned in letters to the children of her former governess, and then published as a little book by Frederick Warne in 1902. Her anthropomorphized rabbits were an instant hit, and they were followed quickly by tales of Squirrel Nutkin, the tailor of Gloucester, Hunca Munca, et al. She was for a time engaged to be married to her publisher's son, Norman Warne, but he died. Potter went on to achieve self-sufficiency with the purchase of her own Lake District home at Sawrey in 1905, and she later settled down to happy married farm life with Anglican barrister William Heelis. Although Lear had access to volumes of diaries and letters, her shaping of Potter's intriguing life is rather blockheaded. "OVER THE HILLS AND FAR AWAY"